Make the cocktail sauce Roast the jalapeño directly over a gas flame, turning, until blackened all over, about 8 minutes. Peel, seed and mince the jalapeño and transfer to a small bowl. Whisk in the next 6 ingredients and season with Tabasco and salt. Fry the oysters In a food processor, pulse the panko until finely ground; transfer to a medium bowl. Whisk in the masa harina, all-purpose flour and Creole seasoning. In a large cast-iron skillet, heat 2 inches of canola oil to 375°. Dredge each oyster in the panko mixture and transfer to a baking sheet. Line a second baking sheet with paper towels. Working in 3 batches, fry the oysters, turning, until golden brown and crispy, about 1 minute per batch. Using a slotted spoon, transfer the oysters to the paper towels to drain. Season with salt. 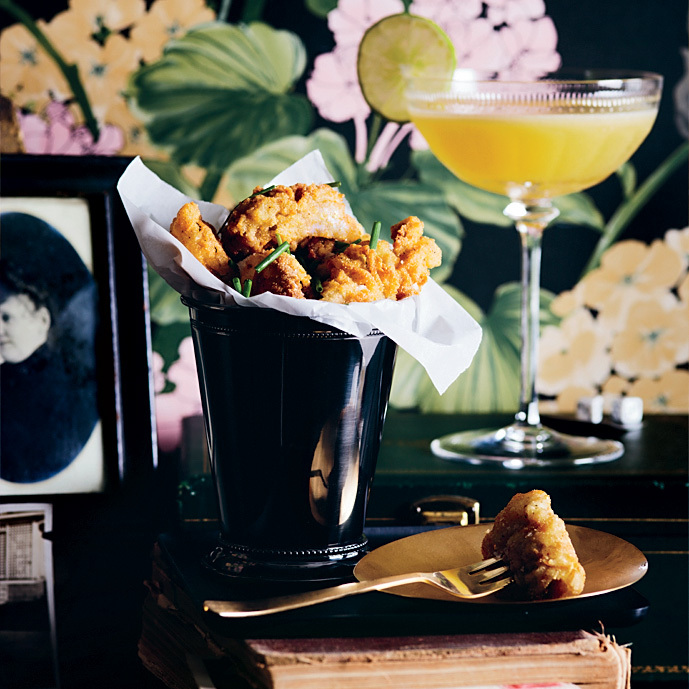 Garnish with chopped chives and serve immediately with the cocktail sauce and lemon wedges. The cocktail sauce can be refrigerated for up to 1 week. Masa harina is a soft flour made from finely ground dried corn kernels and can be found in the ethnic food aisle of most grocery stores. Creole seasoning can be found at most grocery stores in the spice aisle. Coastal Italian white: 2015 Terenzuola Vigne Basse Colli di Luni Vermentino.